The Pacific Northwest is filled with natural wonders, and Washington State, where I live, is a particularly amazing place. 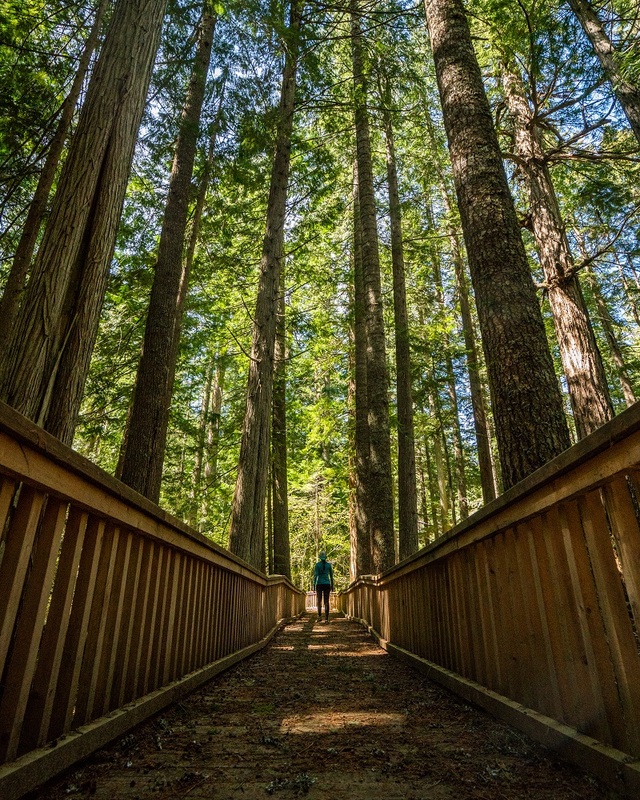 Since my wife and I moved here from the Midwest in 2013, I’ve been able to explore nearly every corner of the state: hiking and climbing in the Cascade range, exploring the temperate rainforests on the Olympic peninsula and along the coast, and taking in the vast dry plains and deserts in central and eastern Washington. Being Seattle transplants, we often host friends and family visiting from outside the northwest. This spring, anticipating my family’s visit, I wanted to give them a taste of the state’s natural beauty and laid-back culture by taking them up the Skagit Valley for a few days. The Skagit River begins in Canada, snakes its way into the U.S., and runs through much of the North Cascades before reaching the Salish Sea. Bald eagles love to soar above its rippling waters, and the way the mountains rise up over the valley lowlands is a sight to see. A trip through the Skagit Valley never fails to impress. After their flight from Minnesota, my family was together at our home in Seattle. My wife and I packed the car with a few provisions and some camping equipment, and had my mother and sister jump in. We drove the 1-2 hours north from Seattle to see what the Skagit Valley had to offer. Following a stop at a local market, our road trip would take us from the mountains back to the coast. Our first stop was to Anacortes, a seaside town with ferry service to the San Juan Islands, a popular summer destination. The town is always charming, with a selection of small shops and restaurants, but we were especially lucky to arrive just as the Anacortes Farmers Market had opened. The tables were filled with spring’s bounty. We opted for some fresh baked scones and hot coffee. 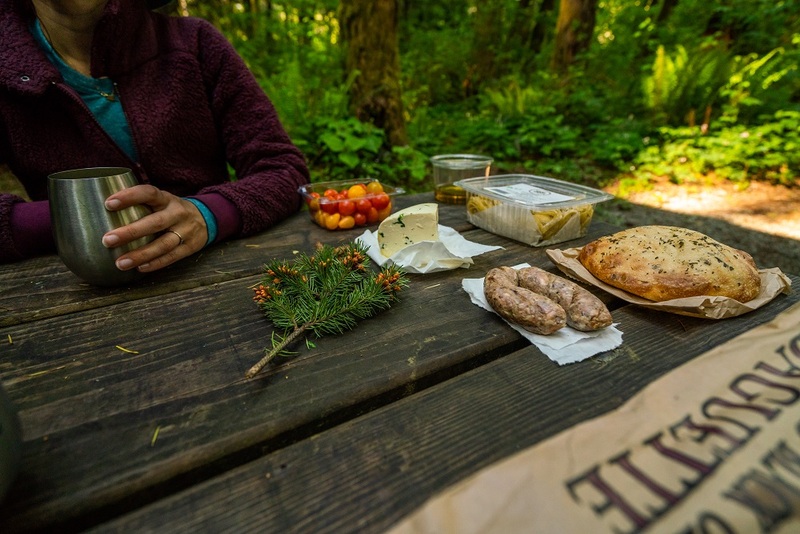 We bought a wedge of sharp cheese, a loaf of fresh bread, and some homemade noodles that seemed like an excellent choice for the night’s dinner on our own while camping. Following the farmers market, we navigated east along the river. Our path took us through flat farmland, but the slopes of the North Cascades loomed ever closer. In Sedro-Woolley, we stopped at the Woolley Market, a grocery and deli filled with local provisions, and we made a few additional purchases: quinoa salad and some house-made sausage for lunch. 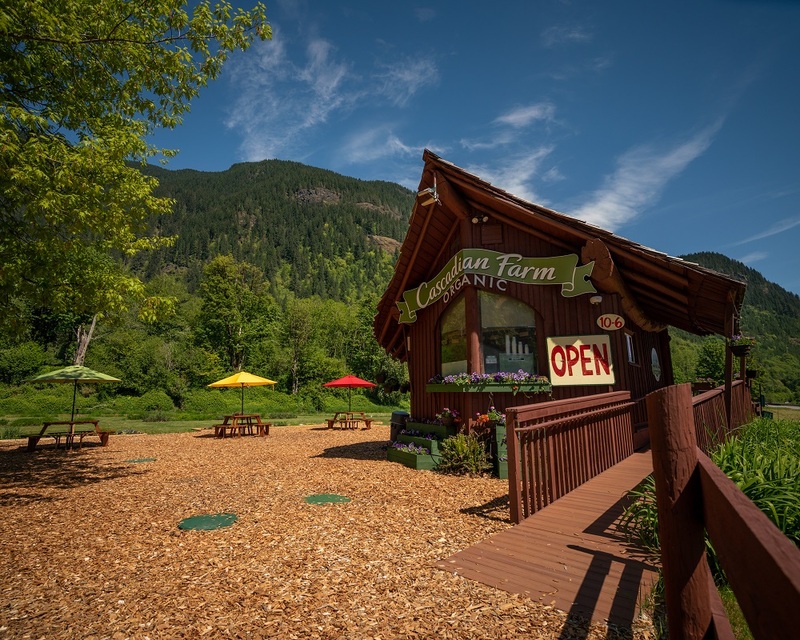 Our ample stock of food, however, didn’t prevent us from stopping at the Cascadian Farm shop just outside of Marblemount for some pre-lunch ice cream, on our way into the mountains. The day was sunny with blue skies—a perfect day for exploring and hiking the North Cascades National Park. I steered the car in the direction of Diablo Lake, a deep azure-blue lake nestled amid the North Cascades. 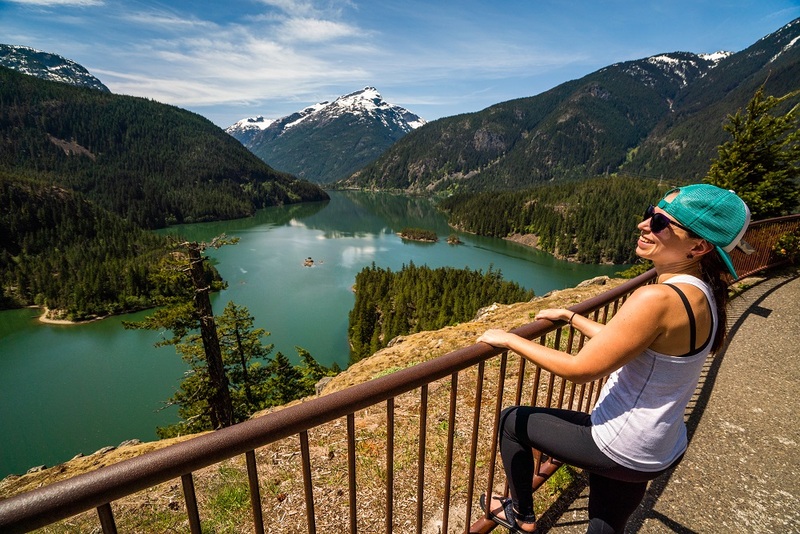 We arrived at Diablo Lake and took in the stunning views, which are always a sight to see. There we enjoyed our lunch with the local foods purchased at the market earlier that day. It was the perfect midday meal in a perfect setting. Following lunch, our group did a short hike near Diablo Lake, stopping to marvel at a waterfall and wildflowers, including wild orchids, along the way. After our hike, we started working our way back west, pulling into Rasar State Park in the late afternoon. I’d made a campsite reservation at this 180-acre park, one of my favorites, and we explored a bit before lighting the stove, boiling up the fresh pasta, and devouring dinner. 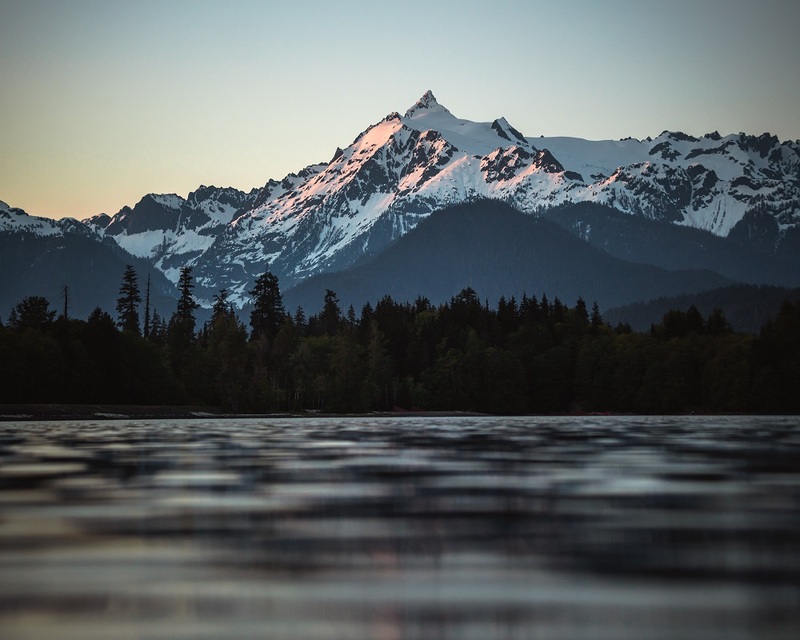 Feeling full and satisfied, we drove to nearby Baker Lake just in time to snap a few photos of the sunset and Mount Shuksan, one of the most iconic peaks in the North Cascades. We slept that night in an Adirondack back at Rasar State Park, an open-air sleeping structure with bunks for four people. The next morning we woke to another beautiful day. Refreshed and hungry again, we packed up our campsite and drove to the little mountain town of Concrete, home to one of my favorite spots: 5Bs Bakery. 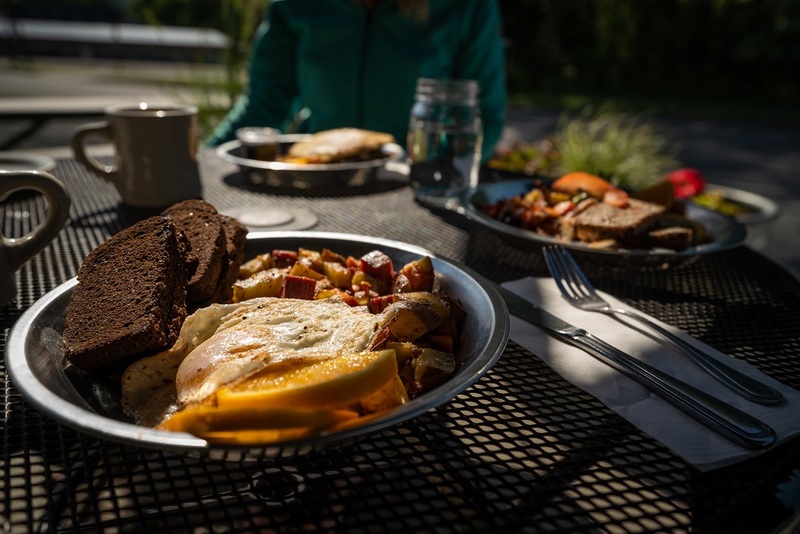 The gluten-free eatery has everything from pinwheels to pies, and serves a breakfast menu that includes eggs and hash and waffle sandwiches. It was enough to keep us fueled for much of the day as we road tripped back toward the coast. Driving past beautiful farmland and waterways, we finally reached Mount Erie to take in the view of the Skagit Valley and the Salish Sea. The various islands were scattered across the scene, creating a visual we sat and enjoyed for some time. 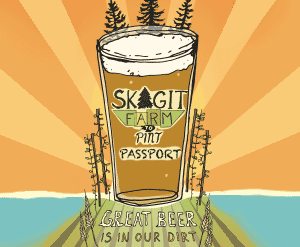 Before returning to Seattle, we found a great opportunity to stick in the Skagit Valley a little longer: the Skagit Farm to Pint Ale Trail. The “trail” includes a variety of breweries throughout the Skagit Valley that give visitors a chance to try local brews. We chose the newly opened Garden Path Fermentation, at the Port of Skagit, which offers a variety of wines, beers, and ciders. Following a tour of the establishment, we raised a glass in celebration of the Skagit Valley, its beauty and bounty, before returning back to our Seattle home.